Are you looking for a Windows application that allows you to convert, resize and rename any of your favorite photos in batch? Here is a tiny photo converter and renaming software which named as FastStone Photo Resizer. 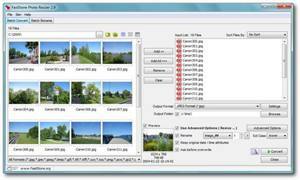 FastStone Photo Resizer is designed for users who want to convert their favorite photos in batch. The image converter software has been designed for users to convert, rename, resize, crop, rotate, change color depth, add text and watermarks to the images in batch. To make it better and easy to use, the software has been improved with the supports of Drag and Drop mouse operation. Supports format including JPEG, BMP, GIF, PNG, TIFF and JPEG2000. Resize, crop, change color depth, apply color effects, add text, watermark and border effects. Search and replace texts in the file names. Support folder or non-folder structure. FastStone Photo Resizer works well with most of Windows platform for PC and Laptop such as Windows XP, Windows 2000, Windows Vista and Windows 7. It is available as a free download with two versions, which are in exe and portable ZIP versions.